My first shots ever were around age 12 at summer camp (with a .22 rifle). In high school, I shot a few friends’ guns and bought my own shotgun (later lost in a house fire). “Practice” was infrequent plinking on the “back 20” (acreage behind the house). In college and dental school, I don’t recall firing a gun at all. Here’s my son’s first time. What a cute fella! 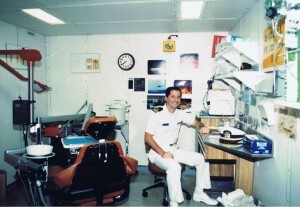 After dental school, I joined the Navy. Dental officers don’t have much opportunity or occasion to be awarded medals or ribbons when stateside in peace time. But, one that we could earn, at will, was a marksmanship ribbon (for pistol or rifle). Pistol was the popular one, and dentists took to it easily given their natural / trained eye-hand coordination. In the Navy, there are three levels of Marksmanship: Marksman, Sharpshooter, and Expert. For Marksman and Sharpshooter, you are awarded a ribbon. If you attain “Expert” level, you are awarded a Medal. A lot of dentists achieved “Expert,” myself included. We’ve got the eye-hand coordination thing down. We’re natural shooters! Here is my “ribbon rack” (six of them, in order – left to right). Top: Navy Unit Commendation Ribbon, National Defense Service Ribbon, Armed Forces Expeditionary Medal. Bottom: Southwest Asia Service Medal, Navy Sea Service Ribbon, Pistol Marksmanship Medal with “E” (expert) device is on lower right. After I earned the Navy Pistol Marksmanship ribbon / medal, I didn’t pick up a gun again… until I was out in the civilian world. Well… that’s not including the time I got to fire a deck-mounted Browning M2 (full-auto .50-cal) on the ship. That was cool! When I was single, living in an apartment, I had an intruder come through my front door at 4:00 am. It turned out to be a “mistake” by one of the complex employees and nothing came of it, except for my own epiphany and some new policies for the apartment complex. I realized that I could not count on the police or anyone else to protect or defend me in the seconds that it takes for things to go badly. I decided to buy a pistol – a Glock 19 (9-mm). I also took a basic pistol course and got a license to carry concealed. That was 20 years ago. After that, practice at a “square range” (indoor range) was in fits and starts for many years. After my current home was burglarized several years ago, my interested in armed self-defense experienced a renewed vigor. I bought additional guns and went to the range more frequently. I taught my wife to shoot, and she got her license to carry concealed. More recently, my daughter fired her first shots. It’s a great family activity! Really… it is! Don’t just be a square! Two square dentists on a square range. What you can do / practice at a “square range” is severely restricted. It’s completely understandable for safety reasons. Most indoor ranges do not allow drawing from a holster. And, most of them do not allow rapid fire. It’s a static paper target being shot at, slowly, by a static shooter. You pick up your pistol from the bench, stand still, and fire… no more than 1 round per second. If you exceed that rate, you’ll hear from the range safety officer. That’s not to say this style of practice doesn’t have value. It does. The very basics of marksmanship are sight alignment and trigger control. If you can’t achieve that at some level of competency, none of the other stuff matters. And, from what I’ve seen at square ranges, some people need a lot of work in that area! To learn about how you can practice your drawing, moving, and shooting skills AT HOME… yes, at home…. check out this article, Dry Fire Laser Training Systems Review. I always wondered if the SHTF… would I be able to draw from a holster and hit a threat effectively (and efficiently). When things go “down,” they go down quickly. We are talking about fractions of a second being life and death. I truly hope I’ll never be tested in real life. I’ll do anything and everything to avoid it. But, after 20+ years of owning firearms and shooting, I wondered if I had it in me to perform. Could I save my own life? Could I save my family from a threat? My initial plan was to take my Glock 23, because I had plenty of .40-cal ammo, and it’s the caliber I carry. It had actually been several months since I had been to the range, so a week before the course, I thought I should make a visit just to shake off the cobwebs. I took my Glock 23 and put about 200 rounds through it. At that point, it occurred to me that two full days of firing .40-cal might be rather punishing (due to relatively heavy or “snappy” recoil). A few days later, I went back to the square range with my Glock 19 (9-mm). Aaahhh…. much better. Much easier. I decided to bring both to the course with the plan to use the G19 primarily, though I only had 1,250 rounds of 9-mm on hand. 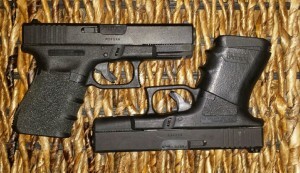 I’d move over to the G23, if I ran out of 9-mm or if the G19 had any mechanical failure. Conveniently, both fit into the same holster. The course started at 9am and ended at 5pm both days. We ended up with only 8 students in attendance, so it made for a nice group. We had two shooting lines with four shooters each. I might have been the youngest one there (or close to it). My classmates represented various “walks of life,” but I’d characterize them all as “good regular citizens.” There were two women and six men. It was a really nice group of people. Our instructor was Robin Brown aka “Brownie.” This class was called “Threat-Focused Pistol.” Threat-focused meant that you are focused on the threat… literally. Your eyes are on the threat. No sights were used. This is also known as “point” or “instinctive” shooting. Most defensive gun uses involve very short distances, and “point shooting” is faster than traditional “sight shooting.” I had heard of it, but I had never tried this before. It included shooting ACCURATELY from the hip, literally… and other positions up to shoulder-level (but still not using the sights). We learned to move and shoot. 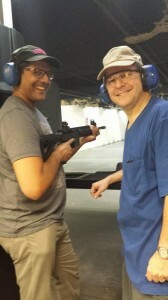 We learned to fire multiple rounds on target very quickly. These point shooting techniques are not new and go back to World War II training. No need for me to go into specifics any more than that. Click the link above for more info. Here’s the bottom line… I learned a lot! I learned that I CAN perform effectively from a holster (and quickly, too)! Anyone can do this, in fact… with the right instruction. We all have the ability to do it. The talent just needs to be unlocked. And, as the saying goes (even with dental continuing education), the more you know, the more you realize you don’t know. I did very well. Both instructors pulled me aside to compliment my progress. That was nice to hear. 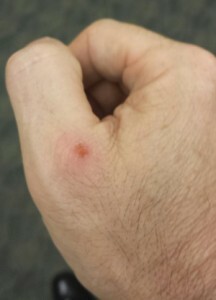 Skinned my knuckle on the edge of the holster leather. I was DRAINED at the end of each day. My shoulder and forearm were sore from so many draws. I skinned my thumb knuckle on the edge of the holster leather the first day from so many draws. That night I took out my trusty Spyderco knife and trimmed that part of the leather away. That proved to help a lot the 2nd day. I also learned that I would like to learn more. I will definitely take more courses, and I won’t wait another 20 years to do it. We were VERY busy either shooting or observing the other line shooting. So, I didn’t have any time to document (video) the various exercises. Some of them were REALLY cool. But, I did get one video of myself reviewing one particular exercise – “Half-hip draw.” The instruction was to draw, fire one shot, and reholster. Then do it again, on demand. This was at the end of the first day. We were pretty tired. 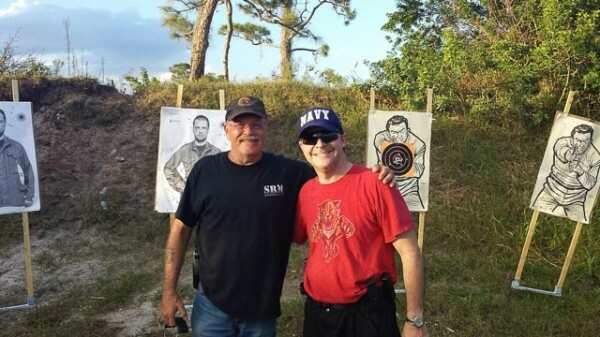 If and when you can, I highly recommend taking a practical / defensive pistol course. You’ll gain confidence and competence. It’s “CE” that could save your life. And, it’s FUN! Edited to add… If you can’t get to the range, Dry Fire practice can be an excellent supplemental and productive way to keep your skills honed. Check out my review of various Dry Fire laser training systems. Have you taken similar practical / defensive courses? Chime in below! This entry was posted in Guns & Knives, Personal Security & Safety and tagged firearms training, instinctive shooting, point shooting, self-defense. Bookmark the permalink. Good article. Mike typically where do you suggest one keep a gun while at home? Say you are working on the computer or at night while asleep, what is the best place to keep it? 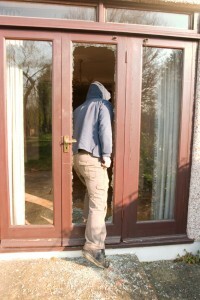 Also maybe for a future blog, but in regards to your home break-in I’d like to hear what you suggest to help keep your home safer from break-ins? I think if the gun isn’t ON you (or right next to you), then it should be in a safe (locked up). This is especially true if you have children in the house. The quick-access safes are nice (biometric or push-button combination). A lot of guys “home carry.” That means even at home, they have a holstered gun on them. Why not? That said… I believe in teaching gun safety to children at an early age. If my kids came across a gun, I’m confident they would know exactly what to do. One should consider that his / her children may not come across a firearm at THEIR home, but rather somewhere ELSE. Even if you don’t own a gun, you should teach your kids about gun safety. We teach them about fires, strangers, water, etc. Why not firearms? But, I keep it locked up, if it’s not directly under my control. Great article! My husband has a G 19, but I haven’t fired it. I guess I am worried about the kickback. Not quite sure why since my husband got my 50 clay pigeons with a shotgun for my birthday…talk about kickback and sore arm! Good for you for teaching your son gun safety. I plan to take my girls on biathlons (skiing or running and 22s) when they are old enough. Talk about losing accuracy. After 5k I am just happy to hit the target anywhere! There is always something to learn. Those Olympic biathletes are AMAZING. Most people have no idea how hard it is to do what they do. The G19 is probably the most popular Glock model of all time. Great gun.